The jack I have is great, but its four teeth can be a bit tough on some surfaces so I was after a pad for it. Having a look around various shops the prices seemed steep for what was effectively a lump of rubber. Then I came across a bunch of posts in various enthusiast car forums about using rubber practice ice hockey pucks instead. I found a supplier who could do two heavyweight pucks with shipping for the same price as a single 'proper' pad off the shelf. 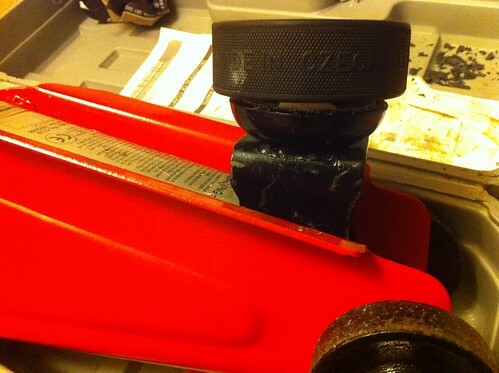 In addition to being better quality, the grooves cut into the puck would make it much more stable than the small recess you get on a normal pad. The process was pretty easy - just apply chalk dust to the teeth of the jack, centralise the puck on top and then cut out where the dust transfers across with a Stanley knife, just watch your fingers! The result is a snug fitting pad which will not slip off and be much nicer than the block of wood I've been using up to now.